Today is National Senior Citizens Day in the US. Senior Citizens Day recognises and values contributions senior citizens make in communities across the United States. Will there be any celebrations? There will be several events and activities today to raise awareness of supporting older people and recognising their achievements. Some people will be raising awareness through social media and news stories, while others organise special community gatherings inviting senior citizens, their families, friends and volunteers. Some businesses will be giving special discounts or deals to senior citizens. However some people celebrate Senior Citizens Day on August 14 as it was the day past US president Franklin Roosevelt signed the Social Security Act in 1935. However, in 1988 Ronald Reagan, who was the US president at the time, declared August 21 to be National Senior Citizens Day. This was established in honour of senior citizens in the US who made positive contributions in their communities. The day was also created to bring awareness of social, health, and economic issues that affect senior citizens. Here in the UK we tend to celebrate Older Persons Day on 1st October. Here at More Than Mobility we highly value the senior citizens in our communities and value the great contributions they have made in the past and still make today. We would like to wish all our American cousins a Happy Senior Citizens Day! Can New Google Glasses Help Deaf People? There are many new technologies that can help people with disabilities but how well do they actually work? The new Google Glasses includes a small computer screen above your right eye. The glasses (which are not available for the general public to buy just yet) will include live subtitling 24/7 and calling up an in-vision interpreter at the touch of a button. Once you wear the glasses you will see a small transparent screen, which will feel as though it is positioned somewhere in the distance, and is in sharp focus. The moment you get the screen into that position the possibilities feel real. The menu system is accessed in two ways. There is a touch screen on the side which can be swiped back and forth, up and down, and you tap to select the option you want. Google glass can also be used for live subtitling. Or you can control it by speaking, but this may be difficult if you’re deaf mind you. As saying “OK Glass” to activate voice commands can be a bit hit and miss if your voice is not clear. It will also have a “wink to take a picture” setting and a live remote captioning software in the real world where the glasses will pick up discussions and describe conversations back to you. Here at More Than Mobility we think the Google Glasses will be useful for some deaf people and we’re looking forward to seeing this being developed and launched. We also provide FREE No Obligation Hearing Test in the comfort and privacy of your own home! Do visit our website for more information: www.morethanmobility.com or call 0800 046 3949. Come and Visit Us at the Northampton Balloon Festival This Weekend for some great Show Offers! If you are in the Northamptonshire area today/this weekend (Friday 15th – Sunday 17th August 2014) do come and visit our More Than Mobility stand at the Northampton Balloon Festival at the Billing Aquadrome. The 2014 Northampton Balloon Festival in its 25 year and one that will be a spectacular sight in the skies over Northamptonshire.Lots of fun activities for the whole family as well as some great mobility product show offers! Whilst ballooning is a weather dependant activity the balloonists want to fly, so if the conditions allow, the balloons will be flying at both 6am and 6pm on each of the three days of the event. Also at 9.00pm on Saturday evening, we will also be having a “Balloon Glow”. Come and watch the balloons turn into giant lanterns tethered to the ground, pulsating to the music – its magical! 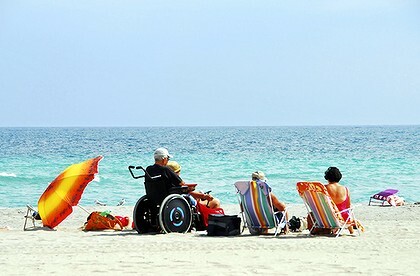 Have you ever wanted to travel abroad, but have always been afraid to do so because of your limited mobility? A new FREE travel guide for disabled people has been launched by the Equality and Human Rights Commission. The new travel guide is aimed at making journeys from the UK and Europe by air as smooth and stress free as possible for disabled people. The travel guide includes what services disabled people, individuals with reduced mobility and their families can expect from airlines, travel companies and airports. Here at More Than Mobility we believe everyone should know their rights. This guide will provide you with information on what travel organisations are legally obliged to provide you or a loved one. The guide contains 15 top tips for a smooth journey, covering areas such as assistance dogs, accessibility, getting mobility and other essential equipment on board, and seating arrangements. The guide will be distributed throughout airports, travel companies and organisations working with disabled people, the free step by step guide can also be downloaded from the Commission’s website. Lord Chris Holmes, disability commissioner at the Equality and Human Rights Commission said: “Dignity and respect are values we all share, yet too many disabled travellers experience the opposite. Here at More Than Mobility we believe that we should stop and think about the events that happened during the First World War. But why should we remember the First World War? By the end of the WW1 there were very few people in the countries that took part who were unaffected by the war, as it reached out and touched almost everyone’s life in some way or other. The children subsequently grew up with their fathers absent or lost. Women also became involved, picking up the pieces of industry and agriculture as the men went off to fight. By 1918, they too could join the army and serve their country. Men enlisted, or were called up, in their millions, being sent to fight in places that many had never heard of before. It was most definitely a global struggle. Life changed forever. Nothing was ever the same again. The war caused many casualties and laid waste to whole. Over 9 million soldiers died as a result of the fighting, nearly 6 million civilians died from disease or starvation and more than 21 million people were wounded. Here at More Than Mobility we believe that the First World War should not be forgotten. We believe each generation should know and remember what happened many years ago.